These are the words of Cliff Barrows, music and program director for the Billy Graham Evangelistic Association, who has led congregational singing and Crusade choirs around the world with Billy Graham. Mr. Barrows first met Mr. Graham while on his honeymoon with his first wife, Billie (deceased), near Asheville, N.C., in 1945. Music played a significant role in the programming of Billy Graham Crusades, for which Mr. Barrows was responsible since they formally began in Grand Rapids, Mich., in 1947. Together, he and Mr. Graham shared the Gospel around the globe. From the beginning of Mr. Graham’s Crusade ministry, George Beverly Shea and Cliff Barrows were the nucleus of the Crusade musical team. They were joined in 1950 by pianist Tedd Smith, and through the years, organists Don Hustad and John Innes provided additional accompaniment. Mr. Barrows has remained active in his later years in the Billy Graham Evangelistic Association. He served as host of the Hour of Decision radio program for more than 60 years. He remains the host of the Hour of Decision Online Internet radio program, which posts weekly on BillyGraham.org. He has served on the Billy Graham Evangelistic Association Board of Directors since 1950. In addition to singing at Franklin Graham Festivals and Will Graham Celebrations, Mr. Barrows regularly hosts SeniorCelebrations and Christmas at The Cove, three-day events geared toward senior citizens at the Billy Graham Training Center at The Cove in Asheville, N.C. He also has helped with BGEA’s Schools of Evangelism ministry for more than 40 years. For significant contributions to Gospel music, Mr. Barrows was inducted into the Nashville Gospel Music Hall of Fame in April 1988, and into the Religious Broadcasting Hall of Fame in February 1996. 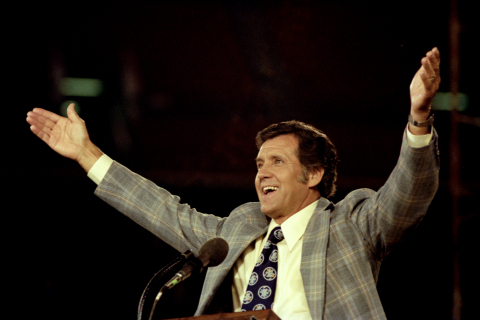 Mr. Barrows was also inducted, along with Billy Graham and soloist George Beverly Shea, into the inaugural class of the Conference of Southern Baptist Evangelists’ “Hall of Faith” in 2008. Mr. Barrows was born and reared in Ceres, Calif. He was married to his first wife, Billie, for nearly 50 years. Then God brought Mr. Barrows and his second wife, Ann, together following the death of both of their spouses to cancer. He and Ann make their home together in Marvin, N.C.
Mr. Barrows has five children: Bonnie, 1948; Robert, 1950; Betty Ruth, 1953; Clifford (Bud), 1955; and William Burton, 1962.